A long list of improvements made to the 2019 Honda Ridgeline delivers one of the most extensive ranges of comfort and convenience features in the midsize pickup truck category, along with the most spacious and versatile interior and highest available payload capacity in its class. The 2019 Ridgeline offers a sleek, sophisticated and rugged exterior design, incorporating premium features including standard LED taillights and available features such as LED projector headlights and LED daytime running lights. The premium quality of the new Ridgeline carries over to the interior, where designers have applied high quality, soft-touch materials throughout the cabin. The 2019 Ridgeline offers a high-quality cabin also with an array of standard and available features and technologies, including an eight-inch Display Audio touchscreen with Android Auto and Apple CarPlay connectivity, a new Honda Satellite-Linked Navigation System, three-zone automatic climate control, an eight-way power driver's seat with adjustable lumbar support, and ambient interior lighting. The Ridgeline has a 60/40-split and folding rear seat offers comfortable seating for up to three passengers and, with the seat bottoms folded, has the ability to carry bulky items in the interior like a 55-inch class flat screen television or a mountain bike with the wheels attached. 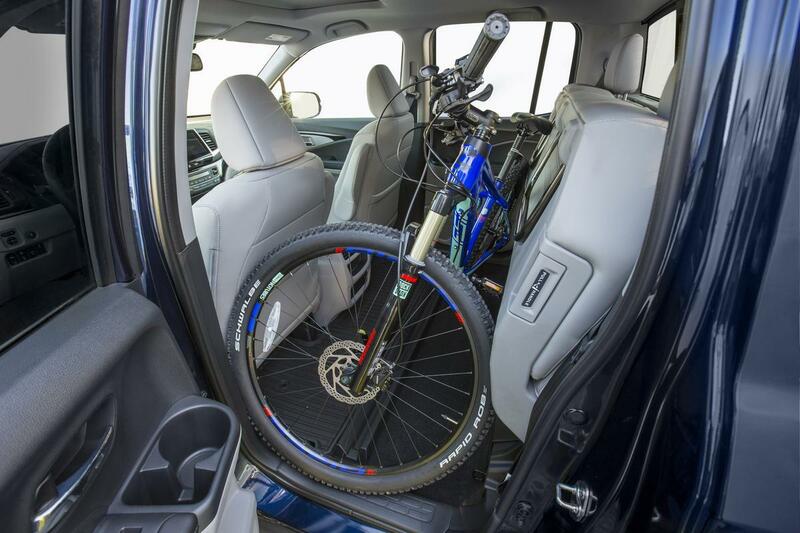 Exclusive in its class, the Ridgeline's large under-seat storage area can carry long items, such as golf clubs, with the rear seats folded down. Unlike competitive midsize pickups, the Honda Ridgeline is constructed with a rigid unitized body with three times the torsional strength of traditional body-on-frame designs that date back to the Model T. And unlike body-on-frame pickups, Ridgeline unibody can accommodate four-wheel independent suspension. If you’re thinking that a body-on-frame is the only way to go in a midsize truck, the Ridgeline is out to dispel that myth with a class-leading maximum of 1,584-pound payload capacity and up to a 5,000-pound tow rating. All models of the 2019 Ridgeline feature a standard Class III towing hitch and AWD models add a seven-pin wiring connector. Buyers can choose from two-wheel-drive and all-wheel-drive configurations. All-wheel-drive Honda models are utilized with the most advanced AWD technology – Intelligent Variable Torque Management (i-VTM4), which provides enhanced all-weather performance and handling. Ridgeline incorporates an Intelligent Traction Management System that enables up to four different operating modes with the push of a button: Normal, Snow, Mud and Sand for the AWD models, as well as Normal and Snow for 2WD vehicles. Honda has proven and powerful 280 horsepower, 3.5 L all-aluminum direct-injected i-VTEC V6 engine powers the 2019 Ridgeline. The engine features Variable Cylinder Management (VCM), a fuel-saving technology that automatically deactivates a predetermined number of cylinders based on driving conditions. The advanced engine is mated to a wide ratio six-speed automatic transmission. There’s much more to the 2019 Ridgeline than we can cover here, like Push-Button Start, Remote Engine Start, Smart Entry, a power sliding rear window, available heated front seats and a heated steering wheel. The only way to truly appreciate how the 2019 Honda Ridgeline can meet your needs is to visit the expert sales staff at Mel Rapton Honda. We can help you select the Ridgeline model that best fits your needs and send you out for a test drive. No doubt you’ll come back impressed.